This is unsurprising, given the fact that 500 years covers an immense span of history and the Mediterranean world covers a variety of cultures, no matter how Romanised or Hellenised many of the writers in question were. Even if we imagine those bits of the Patristic legacy that are more or less Graeco-Roman in outlook, reading them is not exactly the easiest thing one can do. More than 1500 years separate us from these authors. They think in different categories much of the time. There is an uncomfortably strong undercurrent of misogyny in many of the Fathers, along with an uncomfortably strong feeling of Judenhass. * Even when we would probably agree with their morals, we find them thinking like Platonists or Stoics — or, at least, what looks to be Platonism and Stoicism in Christian garb. For those with a Classical background, the Fathers are less jarring. In love, at least in the idea of agape as we find it in some parts of the New Testament, the lover affirms the reality and the otherness of the beloved. Love does not seek to collapse the beloved into terms of itself; and, even though it may speak of losing itself in the beloved, such a loss always turns out to be a true finding. In the familiar paradox, one becomes fully oneself when losing oneself to another. In the fact of love, in short, both parties are simultaneously affirmed. This wisdom is sometimes hiding in places that need a lot of love to be unlocked, as in my occasional forays into demonology show us. However, the meaning of demonology for virtue, ethics, and the battle against evil in all its forms has been unlocked by a loving, attentive reading of Patristic hagiography. With a good introduction and persistence, the Fathers become less strange — or, at least, more comprehensible. I promise that the more you bear with them, having adopted the hermeneutic of love, the less strange they become. 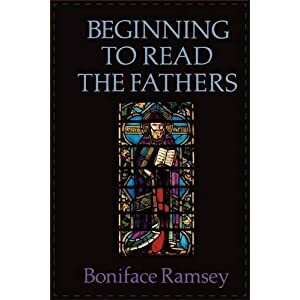 If you are here and thinking that you’d like to check out an introduction to the Fathers, a good single-volume introduction that does not mince words and even has a reading programme at the back is Beginning to Read the Fathers by Boniface Ramsey. *Lit. “Jew-hatred”, the German word for “anti-Semitism”; I picked it up from Dave Sim’s comic book of the same name and greatly prefer it because anti-Semitism is too antiseptic for the brutal evil that racial violence is. How are we to interpret the Bible? In Holy Week at the Small Group we looked at some of John Donne’s Holy Sonnets, and Easter Week we perused George Herbert. Donne’s poetry is available via Luminarium, and the sonnets we read were numbers X, “Death Be Not Proud,” XI, “Spit in My Face, You Jews, and Pierce My Side,” XIII “What If This Present Were the World’s Last Night,” and XIV, “Batter My Heart, Three-person’d God.” Herbert’s were “Good Friday,” “Sepulchre,” “Easter,” and “Easter-Wings,” all available at Luminarium save “Good Friday” somehow. Today let us consider John Donne’s, “Spit in My Face, You Jews.” All of the above-mentioned poems are worth reading several times. Indeed, we read them all aloud twice each. Here is John Donne’s eleventh Holy Sonnet. Read it to yourself a few times, especially aloud, even in company. Who could do no iniquity, hath died. My sins, which pass the Jews’ impiety. Crucify him daily, being now glorified. He might be weak enough to suffer woe. Part of the appeal of this poem is its provocative first line. I think it’s supposed to make you think that Donne is being racist. Only he’s not. I don’t know if he was in real life, but this poem is not racist. Read it again if you thought it was. That first line is calling the Jewish people of the first-century to spit in Donne’s face. Why? Because these people killed the sinless one, “who could do no iniquity.” And Donne? Oh, Donne’s a sinner. Read his un-holy sonnets. Donne is the one who deserve buffetting, scoffing, scourging, and crucifying, not Jesus. He is calling on the Jews to turn their attentions to himself instead of to Christ. This fact is central to the mystery of Good Friday, the glory of the Cross — we sinners who deserve death are spared, while the livegiver who has done no wrong dies on our behalf. Jesus on the Cross is showing us the upside Kingdom of God’s mercy — not simply pardoning as an earthly king, but bearing our punishment. And yet we surpass the impiety of the first-century Jews. We, by our sins, crucify Jesus daily. What impiety! What sin! Should we not feel sorrow and seek to amend our ways? Finally, we see that God, YHWH, who is impassible, who cannot suffer, has “clothed Himself in vile man’s flesh” — in order to “be weak enough to suffer woe.” Christ, who is himself perfect God, tasted all there is to taste of humanity, including suffering, including woe, including death. All of these things are now taken up into God through the Incarnation and Crucifixion. Our pain is known to the Almighty, and he shall not remain silent forever. If you’ve been following my posts on the Cult of the Cross (here and here), I would argue that poetry such as this is part of the early seventeenth century’s Protestant “Cult” of the Cross — devotional poetry reflecting upon the Cross and upon Christ and how Christ might be made real to me, and I might change my ways. He is risen, indeed! Alleluia!! Our Lord and Saviour Jesus Christ trampled down death with death. He rose from the grave and is the firstborn from the dead. We who put our faith in Him shall share in His resurrection and shall one day put on immortal bodies. Through His crucifixion and resurrection, Jesus took on the powers and principalities. He defeated death. He conquered the Devil and his minions. He took on the curse laid upon humanity and the world since Adam and broke it. He released the stranglehold that sin had on humanity. How can we keep silent? How can we not sing His great praises? Christ is risen, let us rejoice! As we sing the great praises of the most high God, as we hymn our Lord Christ, we sing not just of His victory for us human beings but for all creation as well. He is Christus Victor, a fact demonstrated by His mighty resurrection. I find that some of the Easter hymns we sang at Little Trinity on Sunday reflect a Christ the Victor mentality. When we see the debates about Christus Victor, people talk as though NT Wright were doing something new, or introducing into Western theology something long missing. Robert E. Webber says that Christus Victor or the theory of recapitulation are often lacking in Western theology (see Ancient-Future Faith and Worship Old And New ). However, the hymnists of the 1800’s seem to see something of this theme of Christ’s triumph over his foes. And it is not hard to see this great triumph extending not only to sin in humans but the brokenness of the entire world. Finally, Christus Victor does not supplant the idea of Christ as victim, despite what some of its Western detractors and Eastern supporters may say. They are two concepts that help bring out the fullness of what Christ did for us through his passion, death, and resurrection. Indeed, if we are to look at the atonement fully, we will find it lacking if we support only one of these two views, Latin or Classic. Christ is the victor! He has triumphed over his foes! He vanquished Hell! He set free the imprisoned souls! He defeated Satan! He won an endless victory over death! This is the glorious reality of the Easter miracle when a dead Man regained life. That life is now life for us all.